For a couple of months I’ve been taking interest in what people are linking to one of my favourite blogs, Fig Jam & Lime Cordial. Celia connects bloggers by hosting an ‘In My Kitchen (IMK)’ forum where people show what goodies they have in their pantries, their kitchens and showcase some of their favourite foods and recommend suppliers etc. 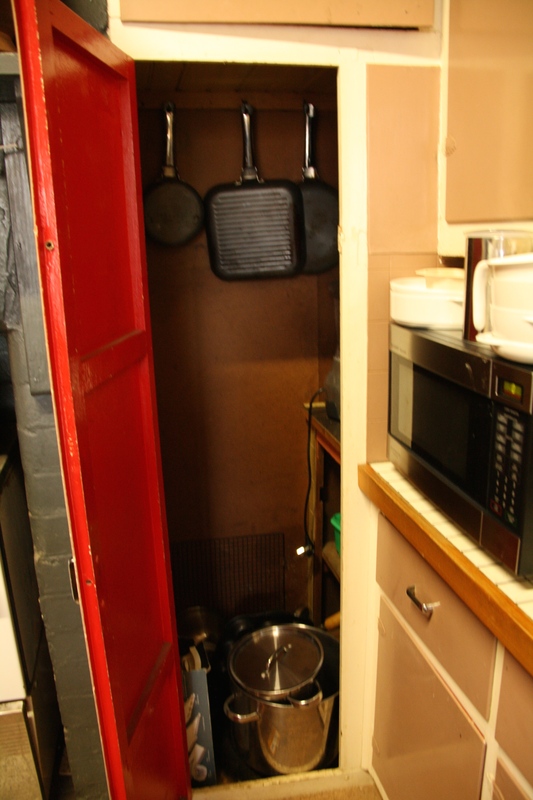 Because I don’t really have a kitchen per say, I didn’t think I would dare post anything but one of the other bloggers who posted to the IMK site commented she thought her kitchen was a bit poxy! I laughed when I had a look and thought it looked like heaven to what I am dealing with. So here goes, here are some things I have to work with until we sell another property that will fund the reno including my new kitchen. I promised myself I wouldn’t put anything in the cupboards, but it’s been 18 months now and I had to do something! This is a cupboard beside the chimney that I use to put saucepans, pasta pots and a couple of electric appliances like slow cookers and my mixer. Like the red inside and the brown outside? So tasteful! My gas range consisting of 2 butane camping stoves. For any heavy-duty stuff like sauce making, bottling and preserving I use a big gas ring I’ve hooked up to a big gas bottle in the outside laundry. Works fine. 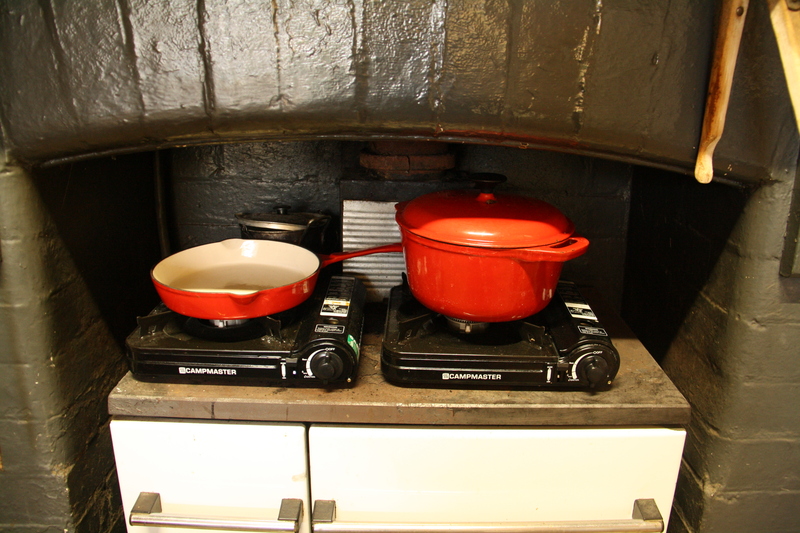 In fact I really like these little stoves and at $12.00 each and 12 cans of gas for about $10.00 at Woolies its pretty economical. Luckily these shelving systems are pretty cheap these days. This can go to the garage if ever we finish the reno. The bag of garlic hanging there is what’s left from my harvest this year. I use these shelves for day-to-day crockery, cutlery and utensils rather than going into the spare bedroom down the hall where I have a spare wardrobe set up as a pantry. 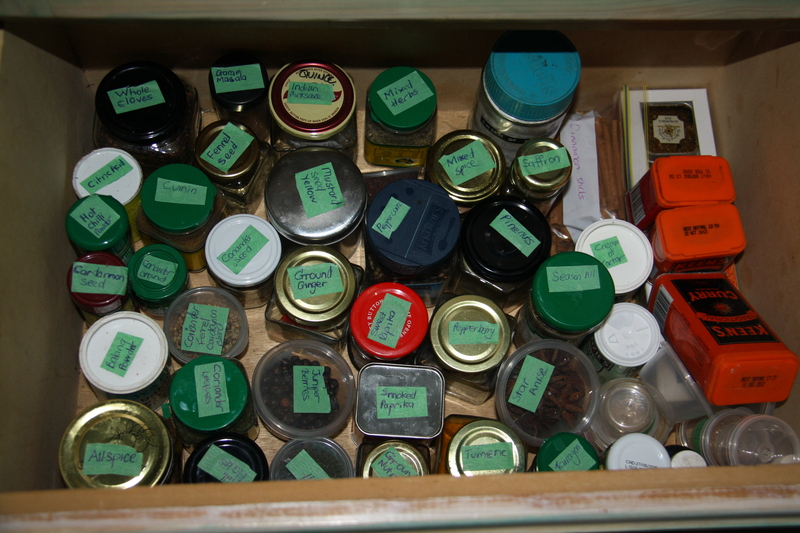 One of the bottom drawers is handy for storing all my spices, the others have stuff like baking paper, mixing bowls, salad spinner etc. My oven is a Sunbeam benchtop pizza and grill which works like a charm! Biggest issue is the limited size of what you can fit into it. If making muffins etc you can only do 6 at a time so have to work using batches. My pizza stone doesn’t quite fit so I’ve improvised by buying a terracotta pot plant saucer and I use that for bread and pizzas. 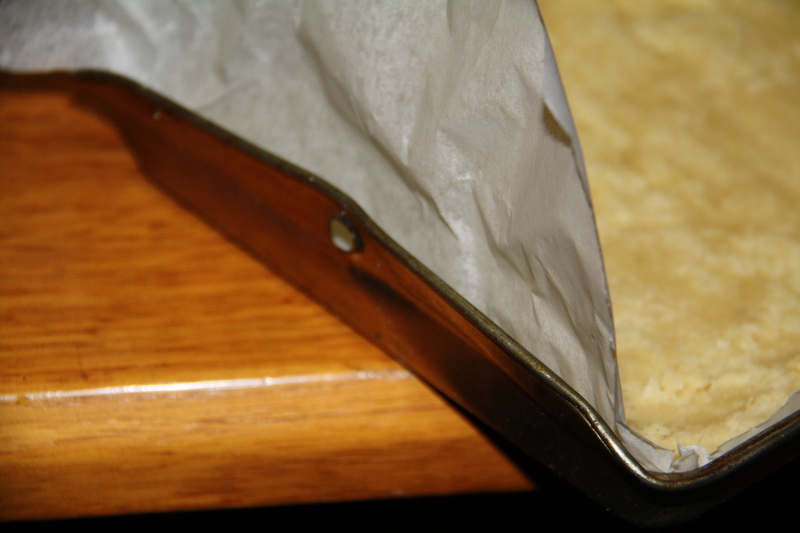 Always improvising, like today when I discovered a slice tray just doesn’t fit in by a whisker. Not to worry, Mr ATMT to the rescue with his trusty shifting spanner! Fits perfectly now! I have quite an assortment of lovely old kitchen collectibles, mostly from Mr ATMT’s grandmother that will be proudly displayed when we finally do the extension. I have a couple of my favourites out just to keep me positive (doesn’t always work!). Food does still happen regardless. I can honestly say that we are coping reasonably well (would have been different if kids were still at home) with these limited facilities. 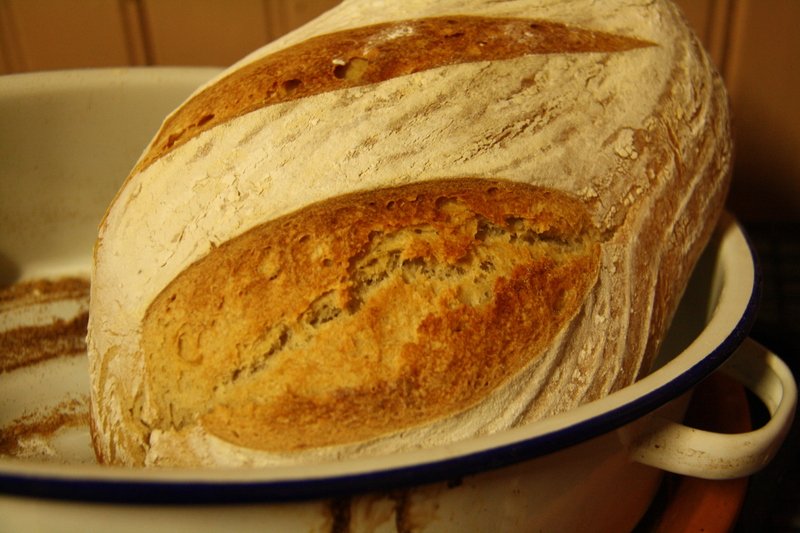 I still manage to make sourdough bread every week, (Celia notice the Falcon pot!). My biggest gripe is that I have things spread far and wide in (and out) of the house and I have no idea where to find stuff when I need it. All of my cheesemaking and preserving things are stored in an outside room that used to be a dentist’s workspace when he came to town once a week. 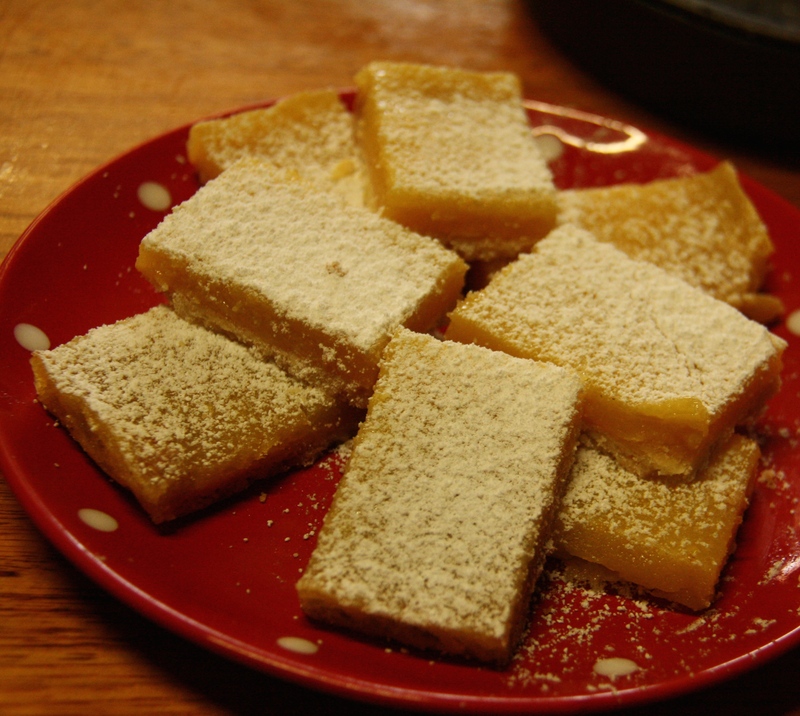 These are the Alice Medrich Lemon Bars I made today. That’s the reason the slice tray needed a helping hand to fit in the oven! I’ve got the base ingredients for some lemon cordial sitting overnight ready to make a batch tomorrow. 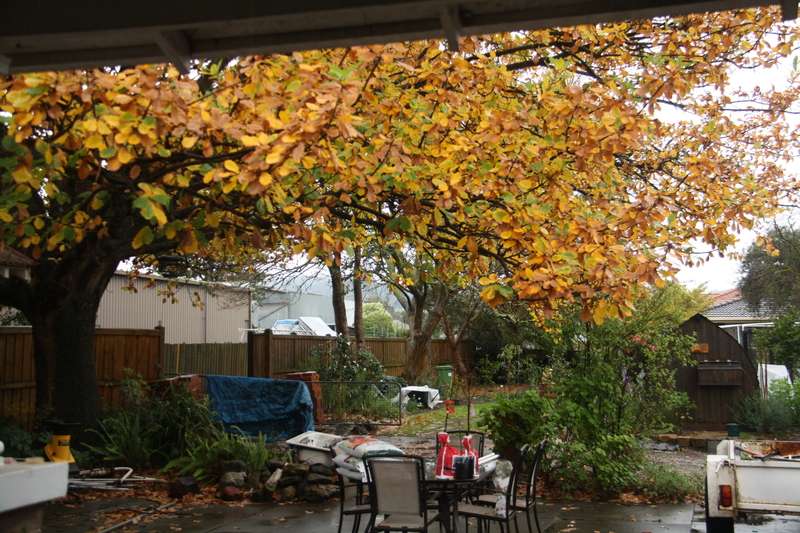 And even though its ugly inside, I do get to look at this beautiful oak tree outside. That’s not too bad! Oh, I forgot to mention we have to get cold water from the bathroom! Sourdough baker, teacher, eater and student. Sustainable living advocate and passionate food grower. Conduct sourdough baking classes at my home and administrator of Facebook support page for Australian & New Zealand sourdough bakers. 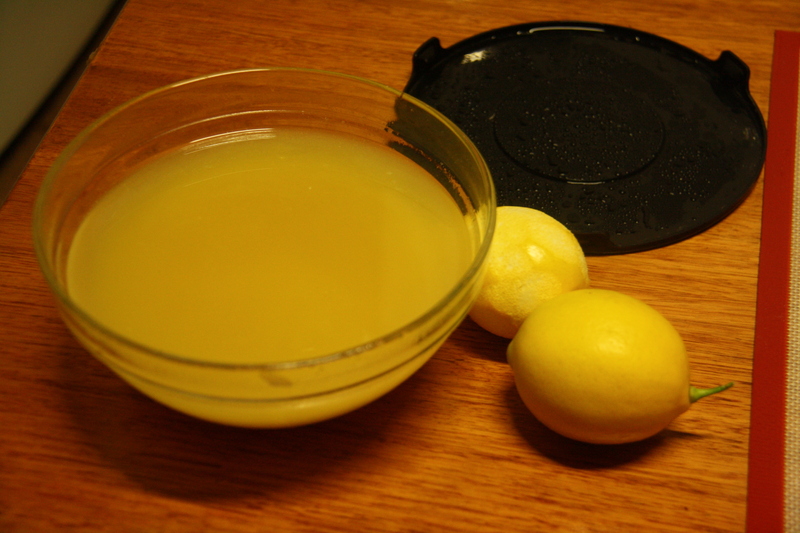 This entry was posted in Bread, Lemons, Preserving, Recipes, Renovation and tagged Alice Medrich Lemon recipe, cooking no kitchen, home made lemon cordial, In my kitchen. Bookmark the permalink. LOL okay I think you win! BUT you score extra points because of the oak tree 🙂 I’m half looking forward to our kitchen renovation but half dreading it, because of having to move stuff around and cook in other areas and losing all my stuff! 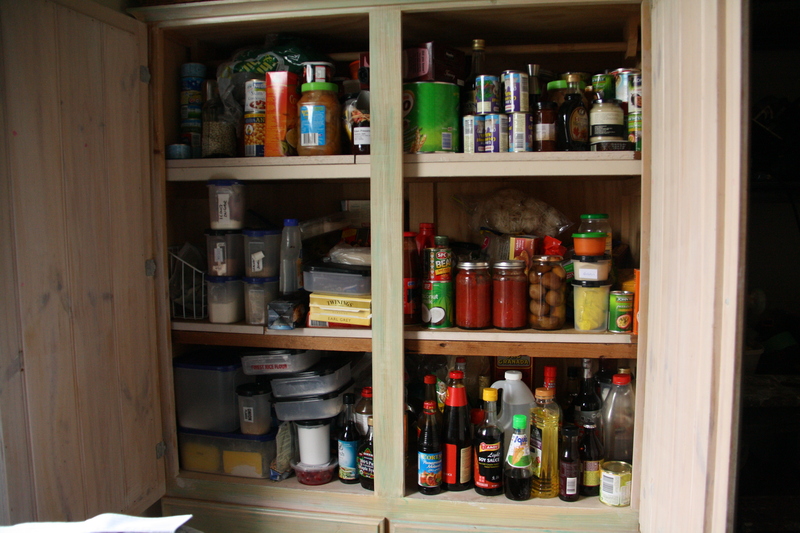 Understand completely, that’s why I didn’t want to put anything in these old stinky cupboards. New kitchen will incorporate windows so I can see the top of the tree as well. Mr ATMT didn’t like the idea of a tree-house that I could go up to from the kitchen! It’s amazing how you can actually get the end result you want with some innovative thinking. Maree, your post just goes to show how innovative cooks can be despite their surroundings. Loved your terracotta ‘baking stone’ idea! 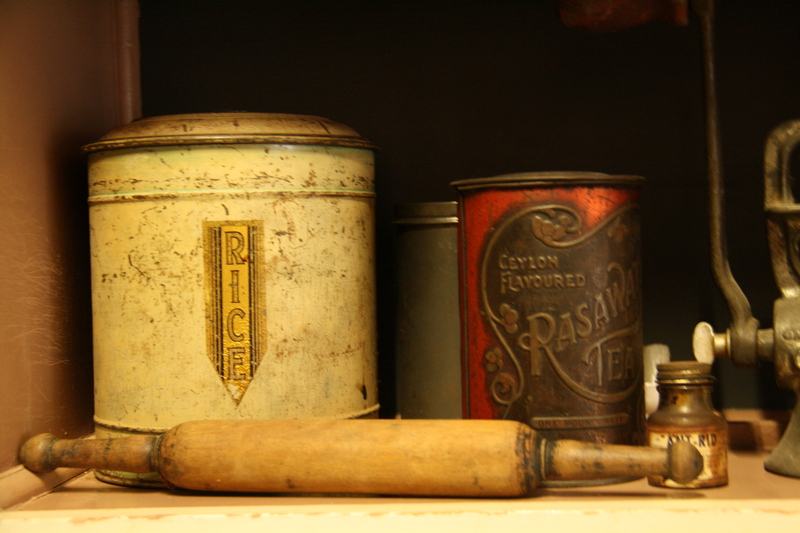 The collection of antique tins is a sentimental treasure. Welcome to IMK! Thanks, love these blogs!Great ways of learning so much. Cheers. Thanks Tandy, I do lose it some days when I can’t find something! Thanks Maureen, rest assured I do my fair (probably more) of whinging! G’day! Love your collectables and can almost smell your bread from here! Thanks for this month’s kitchen view also! 🙂 Plenty of motivation coming from you and your lovely followers! I love this post! I’m sure that many of is can relate, having improvised kitchen spaces before. You’ve been really inventive with yours, and if the great food that is coming out of your kitchen us anything to go by, it’s working well. Thanks, think being a long time camper has helped a bit! Lots of lovely goodies despite the cramped quarters! Hi Maree. Great first IMK post and thanks for letting us peek into your kitchen. It is clear you still cook quite capably despite not having a full sized kitchen. Those lemon bars and bread look divine! Thanks Ngan, finished off the lemon bars today. Really good to have on hand. Most people would just give up, your efforts to still cook are very impressive. Good luck with the renovations! Thanks Danielle, hope the renos aren’t too far away! An inspirational IMK post! Your food all looks wonderful – I’m not sure I’d be bothered to cook too much if I had to get water from the bathroom and go to the bedroom for things. I love your old kitchen collectibles. They are so evocative. I am new to what’s in your kitchen, so my post is a bit late. It is up now if you would like to read it. Take care. Emma.